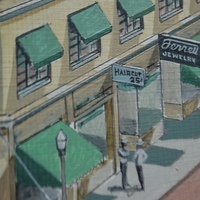 This particular portion of the painting features Star Barber Shop and Ferrell Jewelry. Max Yacobian worked as a barber at Star Barber Shop since 1938, and perhaps as early as the late 1920s. By 1939, he became the sole proprietor of the barbershop located at 205 South Orange Avenuea. After cutting hair for over 25 years, he passed away sometime between 1953 and 1956. This lot, as well as the rest of the block, was later replaced by the CNA Tower and Barnett Plaza. "2007.036.0061." Orange County Regional History Center. http://thehistorycenter.pastperfect-online.com/31399cgi/mweb.exe?request=record;id=2097A1DB-D1F9-4957-B071-814427390952;type=102. Bacon, Eve. "Post-War Building Era Begins." In Orlando A Centennial History, 138. Vol. 2. Chuluota: Mickler House, Publishers, 1977. Sanborn Map Company. Insurance Maps of Orlando, Florida. New York: Sanborn Map Co, 1956. Stoll, James. “Star Barber Shop and Ferrell Jewelry.” RICHES of Central Florida accessed April 25, 2019, https://richesmi.cah.ucf.edu/omeka/items/show/4595.